REVERSE OSMOSIS (RO) Reverse osmosis is the finest level of filtration available. The RO membrane acts as a barrier to all dissolved salts and inorganic molecules, as well as organic molecules with a molecular weight greater than approximately 100. Water molecules, on the other hand, pass freely through the membrane creating a purified product stream. Rejection of dissolved salts is typically 95% to over 99%. 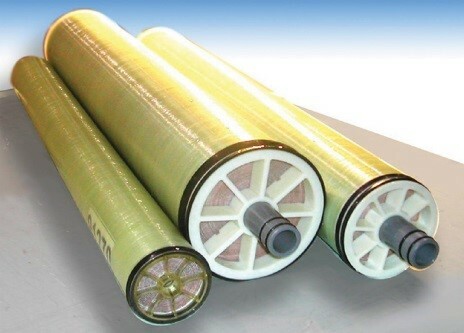 The applications for RO are numerous and varied, and include desalination of sea water or brackish water for drinking purposes, wastewater recovery, food and beverage processing, biomedical separations, purification of home drinking water, and industrial process water. Also, RO is often used in the production of ultrapure water for use in the semiconductor industry, power industry (boiler feed water), and medical/laboratory applications. Utilizing RO prior to Ion Exchange (IX) dramatically reduces operating costs and regeneration frequency of the IX system. Transmembrane pressures for RO typically range from 14 bar (200 PSI) for brackish water to 69 bar (1,000 PSI) for sea water.